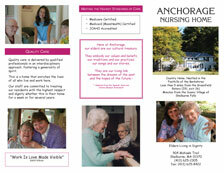 Diane Clancy and Susan Elkin created this brochure to represent the work and vision of Anchorage Nursing Home. They worked very closely with the administration and staff to clarify what Anchorage is about and to represent the unusual aspects of Anchorage to highlight their uniqueness. The former Director of Nursing Services says "The collaboration was wonderfully productive for all of us. They took our ideas and even partial ideas and managed to put forth the real flavor of the Anchorage into the piece. 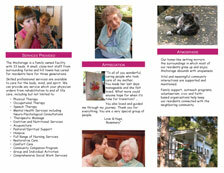 We would recommend Diane and Susan for any project." Susan Elkin took photographs of the staff and residents rather than use hired models, which often is done. Diane Clancy would be glad to speak with you at 413.773.7333.